Carl Esposito is Media General’s senior executive for its Tennessee/Southwest Virginia properties, which include the Bristol Herald-Courier, CBS affiliate WJHL-TV, website TriCities.com and six paid-circulation weekly newspapers. Prior to that, he served as vice president and publisher of the Southwest Ohio Group of Cox Ohio Publishing. 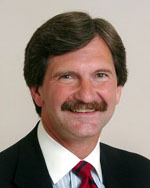 Dating back to 1979, he progressed with Thomson Newspapers in corporate positions of business operations and computer systems, until he became President & CEO of the company’s Southwest Ohio Group in 1993. He holds a bachelor’s degree from Northern Kentucky University and completed executive education courses at Columbia University and Northwestern University. Carl Esposito, publisher, Bristol Herald-Courier, tells the story of the newspaper since its inception in 1865, including the purchase of the newspaper by the Media General group in 1998.